Harry Reid: Senate Majority Leader, multimillionaire, shady dealer, and possible prime instigator of the Bundy Ranch War. Yet another exhibit showing that in our current political system, the worst rise to power. Astrology shows us a bit about what makes him tick. Libertarian: Pallas trine Mercury and square Nodes. This chart is actually a toss-up, with powerful forces on both sides of the libertarian/authoritarian spectrum. Many "whistleblower" types have similar configurations. With the Pallas square to the Nodes, however, there are no guarantees and there may be more "free will" involved with these cases than usual. Reid appears to have definitively chosen force over reason. This configuration combined with Saturn sesquiquadrate Sun (ruler of Pallas) conforms with Reid's strong gun-control stance (for citizens -- not for government enforcers). Saturn-Pallas involvement plus an authoritarian Pallas placement appears in the chart of every gun-control proponent I've checked so far. 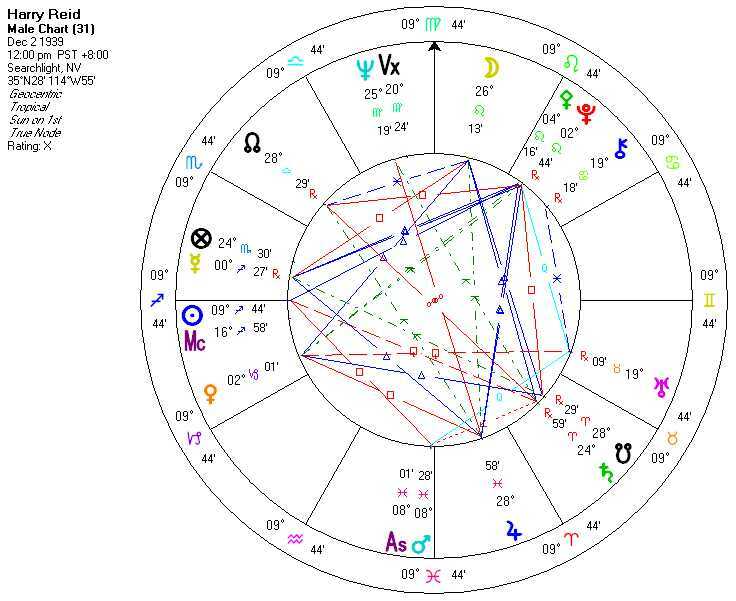 Leftist: Venus trine South Node, ruled by Saturn which is conjunct South Node and quincunx Neptune. We're looking at someone who, bearing in mind the questionable Pallas placement, very likely has zero respect for the property rights of others. Liberal: Moon trine South Node, regardless of time of birth. This is consistent with support for war and disregard for human life, though not a guarantee of such. If this chart analysis looks nearly identical to those of other left-wing authoritarians, that's because it is. The entire human soap opera of warring social/political/economic ideologies is just people acting out their planets. Libertarianism is, of course, the framework that allows for the peaceful coexistence of multiple planetary patterns, by allowing those of like mind to freely associate with one another and form their own societies as long as they allow other societies to do the same.